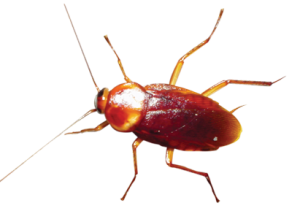 Cockroach control London and the home counties is vital, especially for estate agents, hotels and restaurants, as roaches can spread disease and they provoke human revulsion. The Oriental Cockroach is known as the common cockroach because historically it was the most common cockroach in shops, hospitals and houses. This black cockroach can survive in much cooler and drier conditions such as basements. For this reason oriental cockroaches are probably still the most widespread British cockroach. German Cockroaches are light brown with two dark stripes on the thorax, 12-15mm in length and very good climbers. The Oriental Cockroaches are a dark brown to black colour, 17-30mm in size and can survive in cooler damp areas such as basements and conduits. These common cockroaches can not climb smooth surfaces and are therefore more commonly found at ground level. Oriental Cockroaches have a purse-shaped egg case called an ootheca that holds around 16 eggs and hatches after about 2 months. The German Cockroach egg case holds around 36 and hatches within 1 month. The ootheca of the Oriental Cockroach is dropped early in development and is often well hidden and tolerant to insecticide. This, along with the length of time it takes to hatch and the longer life span of the adult, makes control more difficult. The German cockroach carries the ootheca almost until it hatches and this protection combined with the fact that there are over twice as many eggs and that it hatches twice as fast means that this cocroach breeds much faster although control can be easier. 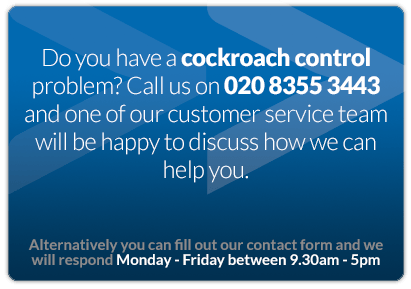 Beaver Pest Cockroach Control London are more successful than most pest control companies because our pest controllers are well trained and primarily use the more expensive gels rather than the more common and cheaper sprays. The gels have a safer but more effective active ingredient and formulation. This is especially important for German Cockroach control London as these tend to congregate in one place and the gel is cascaded down via cannibalism.